31 December 1826; Wychwood Forest, Witney, Oxfordshire. 12mo, 2 pp. Nine lines. Text clear and complete. 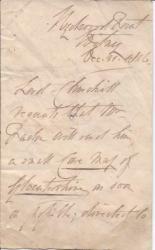 Addressed by Churchill on reverse of the second leaf, with red wax seal, and his frank: 'Witney Dec. thirty one 1826. | Mr. Faden | Map Seller | Charing Cross | London. | [signed] Churchill'. 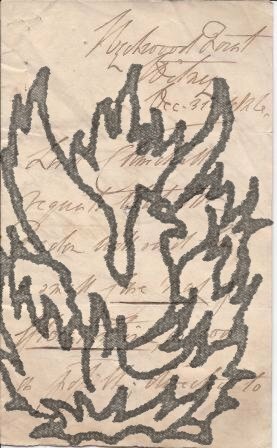 On aged and lightly-creased paper, with a spike hole. Asking Faden to 'send him a small Case map of Gloucestershire, as soon as possible', directed to him by 'Pratt's Gloucester Coach, to be left at Witney'.